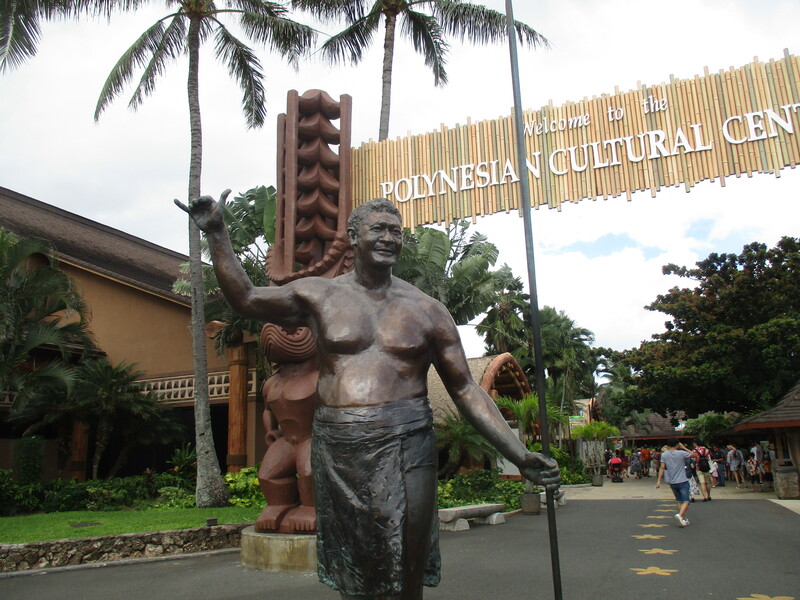 The Polynesian Cultural Center (PCC) is affiliated with Brigham Young University – Hawaii. It was established to help educate people about Polynesian cultures while providing a way for students from Polynesia to pay for their tuition through work. By employing students from the different islands in the Polynesian triangle, the PCC establishes itself as an authentic representation of the history and cultures of the islands. If you want to get the most out of your experience, get a package that includes a guide. You’ll get more activities done and be kept on schedule. If you choose to self-guide, you’ll need to be assertive and ready to ask questions. At 2:30 pm, the Huki Canoe Show takes place. According to the guide on the bus that brought us to the PCC, there won’t be anyone in the villages because they are all performing in the show. Get yourself a seat and enjoy the pageantry and color as the show goes through a general view of Polynesian culture and explores the history of the Hukilau in particular. Rain heavily influenced what we were able to do with our day. Even with ponchos and trying to stay under cover, we were soaked within 30 minutes. Most of the places we ended up had no people because they had been chased away by the water from the sky. The poi station allowed us to try fresh-made poi, which was surprisingly good. It’s basically tarot root with water. When it is stored, it ferments, and the fermentation is one reason why people don’t like it. Another reason is that they eat the poi by itself; poi is meant to be consumed with other parts of a meal. The Hawaiian Game pavilion showed us how to play a tradition Hawaiian game that was a lot like catching a ball in a cup. An added layer of difficulty was that the ball had to hit the underside of the loop before it returned to the cup. I achieved the objective once and quit while I was ahead! In Tonga, we wove a toy fish out of coconut leaves. It included a rod that could cast the fish out to the end of it. It was fun and ingenious. Our main reason for going was the buffet luau. It was difficult to watch the dancers and show while eating, and even having just one couple in front of us made it difficult to see the entire stage and everything that was going on. The performances were energetic, and the 10-year-old fire dancer was AMAZING! At the buffet, I really enjoyed the purple tarot roll. The chocolate cake was moist and the Haupia, coconut pudding, was tasty. The evening ended with “HA: The Breath of Life.” While it does have narrative and pacing problems, the issues are ancillary because the strength of the show is in its presentation of multiple Polynesian cultures and their dances. The main character grows from a child to a man, and each stage of his life is presented on a different island. Fire, lighting and expert choreography are the stars of the show, and the main performer is great. He knows all the dances and even does the fire dancing himself. It is the fire dancers who steal the show, though the New Zealand dancers are a close second. Be careful though, you might find yourself with tears in your eyes during the performance.